has been under intense pressure to drop the public health insurance option. But on Monday he defied insurance lobbyists, political pundits, and conservatives of both parties by announcing that he'll include a public option in the Senate floor bill. That's the kind of courageous leadership we need for victory on health care. But the fight's not over yet: Sen. Reid is still under fire from conservatives, including some in his own party, who will stop at nothing to kill the public option. Move On is asking people to sign a petition in support of Harry's efforts - I've just done so myself. So should you. But - there is a bigger issue here. Harry Reid is facing a brutal re-election fight in Nevada, and if it were held today... he would lose. President Obama asked him to make health care a number one priority, and to negotiate an incredibly difficult legislative process, putting him at the center of a political firestorm, just when he is most threatened. You may remember that the Democrats' last Leader in the Senate, Tom Daschle, lost a brutal election fight after Republicans put him on a hit list - they knew that taking down our leader would weaken the Party, and it did. We can't let it happen again. Harry Reid has put his neck on the line to deliver the President's Health Care Reform - those of us who support it should back him in his Nevada fight as well. I'll talk to you soon about some ways we can all help, but in the meantime - here's a link to Harry's campaign donation page. Chip in what you can (I'm thinking $51 would be a good amount for Americans abroad as the unofficial 51st state). Personally I don't care a fig whether or not women are to be found on the President's basketball court. Well, actually - I do a little bit. 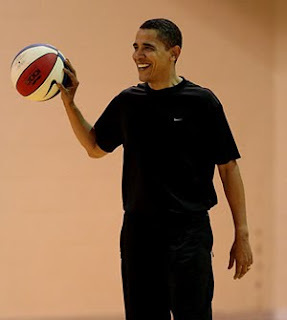 President Obama is, by all accounts, a really good basketball player. As a non-sporty person myself, I would hate to see, for example, Christina Romer taking time out from her important work saving the US economy to learn how to serve as Presidential point guard. Or, do we imagine that the country might be better off in some inexplicable way if the President would recruit in some WNBA stars to play with? Obama has signed legislation to guarantee women the right to sue for equal pay. He has doubled the number of women on the Supreme Court (by adding 1. Sigh). He has appointed a strong female Secretary of State. 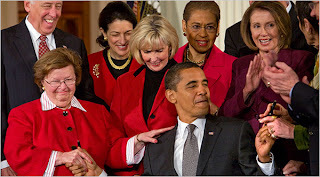 And he is agressively pursuing health care reform that would hugely benefit woman and families. The female Speaker of the House is one of his closest Congressional allies, and he happens to be married to a whip-smart, successful woman and to be raising two confident girls. Let the guy play b-ball with some friends, for heaven sake. Watching Melody Barnes panting for breath as she darts around after an orange rubber ball wouldn't really seem like much a victory for feminism, to me. 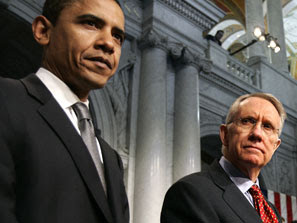 Senate Majority Leader Harry Reid - who by the way has just about the toughest job in Washington right now, and is facing a vicious re-election battle at the same time, poor guy - has announced that he will bring to the floor of the Senate a health reform bill that will include a version of the "public option." Specifically the opt out public option. Any questions? The public option, as you probably know already, refers to the opportunity of choosing to purchase health insurance that is government managed. Under most versions of the bill, including the one Reid is likely to propose, the public option would only be made available to a small number of people - specifically those who do not have or who lose their employer provided health insurance. It would be not for profit, but is not intended to lose money - in face most estimates say it would reduce the government's health care expenditure. These consumers will have the option of chosing from a range of health insurance options across a national exchange, most of which would be privately managed for-profit alternatives, but one of which would be public. Opt out. The opt out version of the public option means that all states will be automatically enrolled, allowing them to offer the public option in their exchange. But some people (Republicans, mainly, but some nervous Democrats as well) are making a big fuss about their preference for removing the public option as a choice. Under the plan now proposed, any state that for whatever reason doesn't want to offer this option can choose not to offer it. States will be automatically IN the program, in other words, but if they don't want to offer people in their state the alternative of purchasing health care in this way, then they can choose to prevent people from doing buying it. Beats the heck out of me. But then I'm not the one who's going around complaining about the supposed budget busting effects of this privision, which the CBO and almost all experts agree would actually REDUCE the cost of health care and the Federal Government's liabilities in this area. Well, for a start - Joe Lieberman. Tonight he came out with a statement that he would would support a Republican filibuster of the bill as it currently stands. 1) The reasons he says he won't support the public option are not actually factually true. 2) Voting to support the filibuster is not the same thing as voting against the bill. Leaving aside the stupidity of his opposition, he could easily choose to vote against the final bill without endangering its passage. But voting with the Republicans in support of a filibuster prevents the bill from even being voted on - this is a far higher standard. 3) Democrats are barely in control of the requisite number to end a filibuster, so it's unclear whether any bill could be passed if Joe and his ilk really dig in their heels on this procedural issue. Why would Joe Lieberman do this? Dunno? Cuz he's kind of a schmuck?